There's a new Barbie doll on the scene and we can already tell you, she's amazing! Gone are the days of Malibu Barbie and her girlfriends all dolled up to the nines whilst hitting the high street, it's time to get more realistic. Last year, Mattel released a number of different dolls with realistic body types, height, religions and skin tones, and now they're switching up the type of career their dolls have - in a bid to reflect a more diverse range of women within society. Now, this doll has been around for some time, but this is the first we're hearing about it! 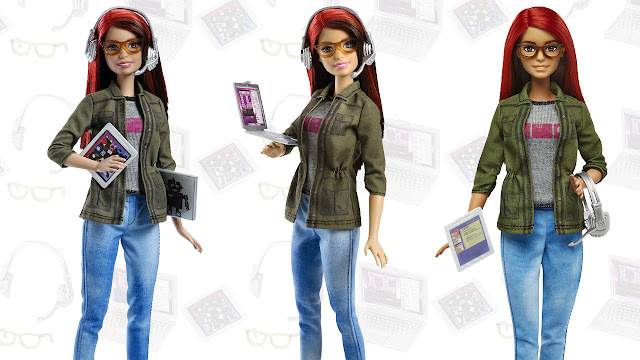 Introducing, Game Developer Barbie - a real down to earth Barbie Girl with comfy jeans, t-shirt, trainers and glasses, along with her gaming headset and laptop with real coding graphics. Picked out by women within the game development profession, this doll is a true representation of the women working within this industry. When the doll was first released it sold out instantly and we can see why. It's refreshing to see dolls that are finally relatable and real - we can now encourage children to play with these dolls because they are starting to look like everyone. We just can't wait to see what they produce next!